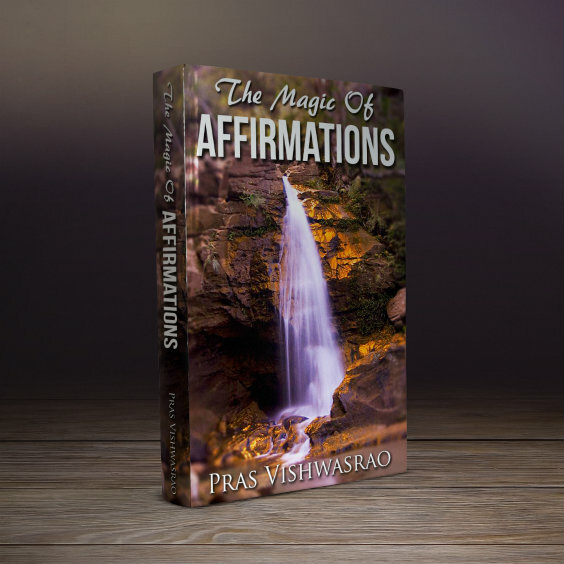 20 Marriage Affirmations For Getting Married And For Preserving Marriage. 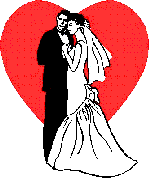 Marriage affirmations can help in getting married as well as in preserving a marriage. Repeat them with faith and trust and let nothing distract your mind. When we repeat these affirmations, our thoughts are focused on our marriage, our partner, our love and nothing else. There is no distraction. Whatever we focus on, grows. A major reason why one remains marriageless is distraction (busy with other things in life) or looking at marriage from a wrong perspective. In today’s career age, both men and women are more interested in making a career. Everything else takes a back space. Marriage is also neglected, until, sometimes it is too late to find a suitable partner. Marriage is neglected because one is focused on career. We eat, breathe and sleep career. What we focus on, grows. Thus, career blossoms, prospects of marriage wither. Marriage affirmations help us rearrange our priorities. When the major thought in the mind is of marriage, the prospects of getting married increase. One starts taking action in the right direction. For those who are already married, sometimes problems arise when both or one partner is distracted. Again, the distraction can be of any kind. An affair, career, an ailment – many things are possible. 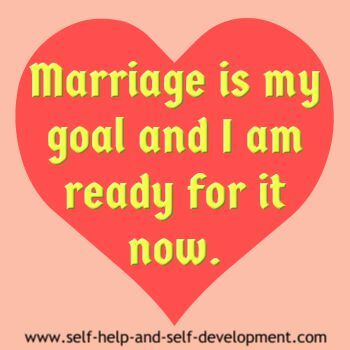 Here also, certain marriage affirmations can shift the focus back to where it is needed. Remember, one has to work the affirmations and one has to work the marriage. Working the marriage involves taking an active interest in the partner, in the family, going out, dining out, taking vacations together, remembering and celebrating birthdays and anniversaries, doing everything that is necessary to keep the interest alive. The marriage affirmations given below should be repeated at least a hundred times daily. It will be still better if you can repeat them more. Do this for not less than 3 – 4 months. The results will be sweet! I am open to marriage and am attracting my partner now. 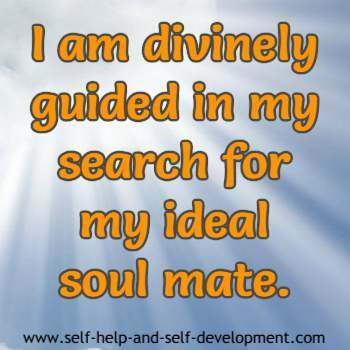 for my ideal soul mate. I am ready for the union now. 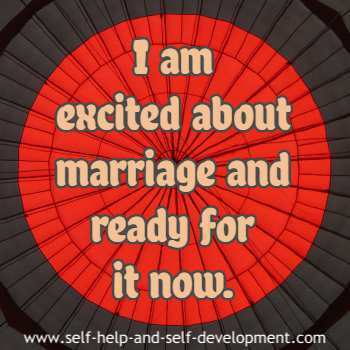 I am excited about marriage and ready for it now. Somewhere someone is waiting for me and I am ready for him/her now. Marriage is the culmination of my love affair with my partner and I welcome it with open arms. I love ___________ and we are now husband and wife. I know that marriage is bliss and I have attained it. My perfect match has already been chosen and he's coming for me right at this moment. 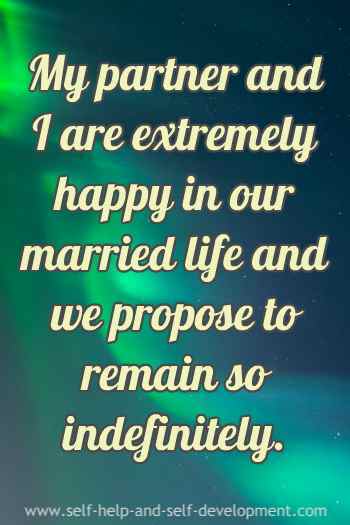 My partner and I are extremely happy in our married life and we propose to remain so indefinitely. 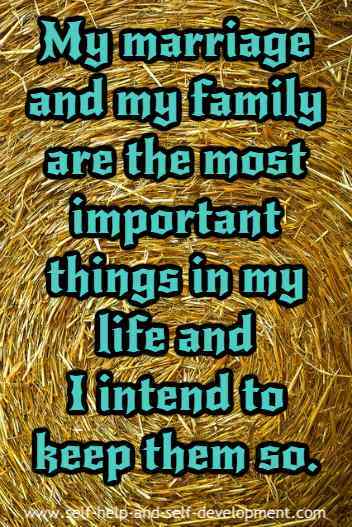 My marriage and my family are the most important things in my life and I intend to keep them so. I love my partner and my partner loves me. We are bound together by holy matrimony for ever. 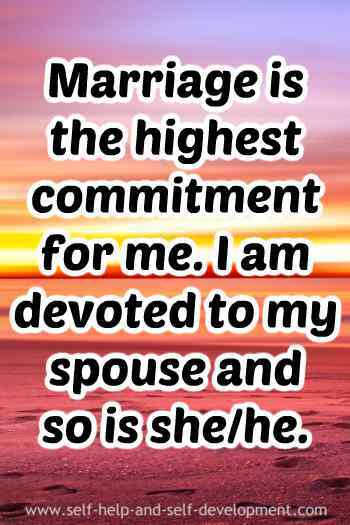 Marriage is the highest commitment for me. I am devoted to my spouse and so is she/he. My partner and I are bound together in eternal love and our marriage is the seal of that love. My marriage is divinely protected. 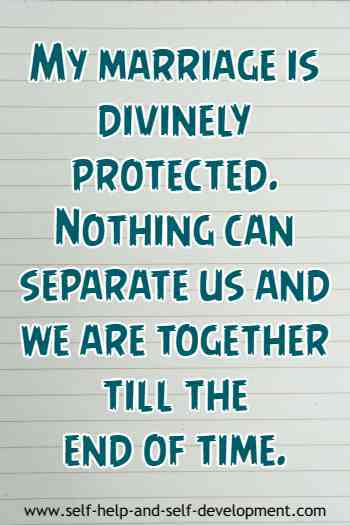 Nothing can separate us and we are together till the end of time. I understand the sanctity of marriage and will remain bound by marriage for all my life. My marriage is the most sacred thing to me and I preserve it with all my might. For me, marriage is the final frontier. I have conquered it and will guard it zealously. Divine power protects my marriage. My partner and I are loved and are safe.